Naked sauna anyone? Read this first. I thought I could handle any social situation until my boyfriend invited me meet friends at a sauna in Germany. No problem, or so I thought. I’ve been to spas and saunas all over the world but before this I had never been to one for mixed sexes and where nakedness is compulsory. This is the norm in Germany, Finland, Austria, Scandinavia and Eastern Europe. He didn’t even say it in his flirty teasing way either, but more in a way a doctor might tell a patient they had to stop smoking or die. Who cares if I wear a bikini? Apparently people complain if you break the no-clothing rule and it can apply to the heated outdoor pool, the sauna and the steam room. The public areas, restaurants and relaxation areas are where people hang around in robes or wrapped in towels. So many questions went through my mind before my first naked sauna. How is one supposed to feel relaxed in a group of new friends when everyone is stark bollock naked? Is there an etiquette one should follow? Do people hug and kiss to greet one another?’ Where do I point my gaze? Would it be like one of those weird naked dreams I had as a kid? Since naked socialising was not something my mother taught me nor something I picked up at Girl Guides, I had to wing it. Now I would say I’ve become a natural at being naked in public. Who would have thought?! Here are my 10 essential things you need to know before going for a naked sauna. Don’t just let it all hang, have some poise. The sauna pose is something I picked up in an Italian spa. As I sat there legs crossed and slightly hunched over I noticed the other glamorous women were sitting with their backs straight and leaning slightly backwards with their arms behind them to prevent everything going south. Much more elegant. This is an obvious one. You will sweat so let’s keep odours to a minimum. People are naked but style is still key. Work with what you have by preening what will be on show. Go for a stylish bikini shaping, tanned torso and manicured nails. Whiten those teeth and extend those eyelashes. If you have a future sauna date planned. Get down the gym and tone up your muscles. It will give you a confidence boost. There are so many stylish accessories I could write a whole blog post just on that. You might want to get an elegant robe or slippers. 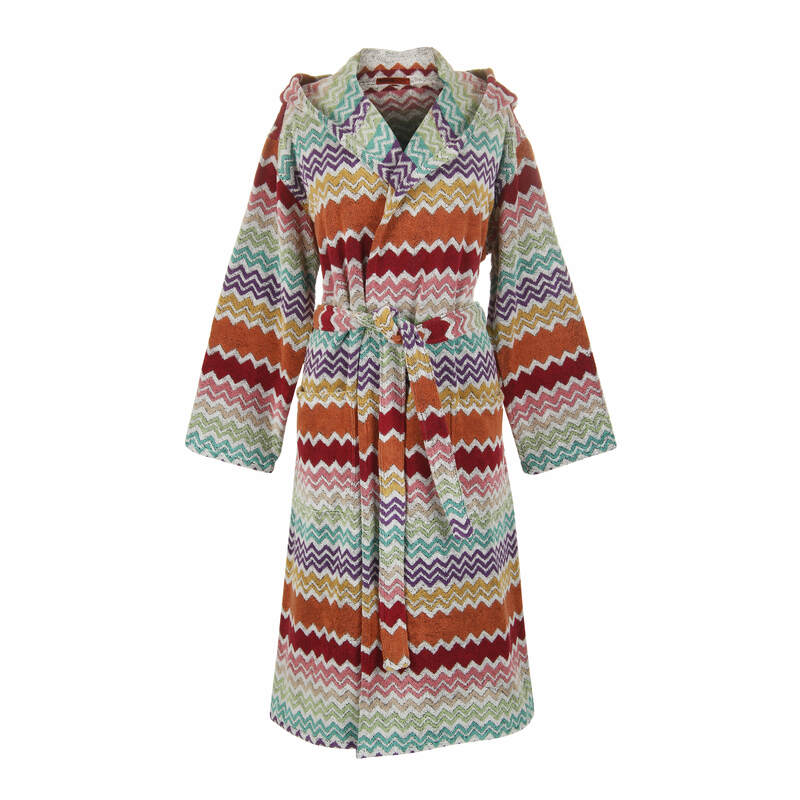 This robe by Missoni Home is on my wish list. As my sauna trips became more frequent my sauna bag got bigger and bigger. You should take a shower gel, body scrub, body lotion, face mask, shampoo, conditioner, make-up, book/magazine, sleep mask, slippers, towel, robe and money. Take your own fresh towel into the sauna and use it to protect your body from the wood. This means every part of your body, feet, hands etc, should be on the towel. Towels are prohibited in the wet sauna so make sure you hose down your seat with water. To join the crowd ot not? As a personal rule. I like a crowded dry sauna because there are so many bodies it doesn’t matter. It can be a little daunting for first-timers when it is just you and one other person. On the other hand I like an uncrowded wet sauna because vision is impaired by the steam and dim lights. Show your gratitude after a sauna infusion – don’t clap! A sauna infusion is a wonderful treatment where a sauna master adds scents to the coals and then uses and towel to waft the aromatic air around the room. After the session people show their appreciation by knocking on the wooden bench, rather than clapping and sending splatters of sweat everywhere. Make friends in the relaxation areas. Inside the sauna is for rest and meditation. People move slowly and quietly so having a conversation is frowned upon. If you want to have a chat go to the heated pools, restaurants and public areas and don’t worry, quiet areas are well signposted. You don’t have to walk around with your gaze firmly concentrated on your feet! Look people in the eyes when you talk to them and let your eyes scan the room if you wish. Treat it as if everyone is wearing clothes. Don’t stare. People don’t like being stared at even when they have their clothes on. No difference really. In Germany it is usual to kiss your friend on both cheeks when you greet them. I would say, greet your friends and acquaintances in a sauna in your usual way and shake hands with new people. Posted in Body/soul, Germany, TravelTagged Finland, Germany, naked sauna, sauna, sauna etiquette, sauna style, sauna tipsBookmark the permalink. Don’t get ripped off at the market, haggle!